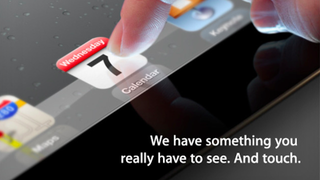 The iPad 3 will be announced on March 7th. Apple has just sent out invitations for an Apple event in San Francisco at 10AM PST on Wednesday March 7th. The invitation not so subtly hints at the Retina Display becoming a reality in the iPad 3. The next iPad has long been expected to be announced on March 7th with the hallmark feature of the 2048×1536 resolution Retina Display and possible quad-core A6 processor. The invitation, which notes that Apple has "something you really have to see" pretty much insinuates that a Retina Display iPad is happening. The invitation also interestingly doesn't show a home button, though that could easily be explained if the iPad in the invitation was in landscape mode.